Busses seen here in the Charlestown lot. 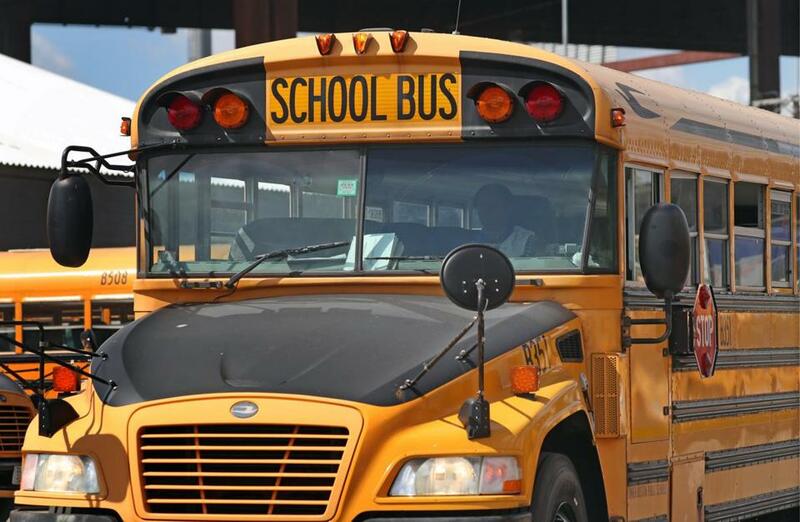 Amid negotiations for a new bus drivers contract, Interim Superintendent Laura Perille said Wednesday that she expects every school bus will be on the road Thursday for the first day of school in Boston, but many would operate as they typically do on their maiden voyages: late. “It’s always a top priority for all of us to get students safely transported to and from school, but it is important that we respect the ongoing contract negotiation discussions and do our part operationally to respond to any and all issues that arise, whether it’s hot weather or bus delays — including again the normal delays that come the first week of school,” Perille said. She said buses often run slowly during the first week as drivers get accustomed to new routes and families to new routines. Contract negotiations with the bus drivers union and the school system’s transportation contractor, Transdev, continued Wednesday. The drivers have been working without a contract since Friday. Their union, which is part of the United Steelworkers, vowed Monday in a flier that members would head to picket lines if they cannot secure a fair contract, although they did not specify a timeline for such action. Earlier this summer, the union authorized a strike before reaching a two-month contract extension. Caught in the middle have been scores of families at schools — mostly independent charters — that began classes in August. Buses have run as much as two hours late, while many have not shown up at bus stops or schools. The school system last week blamed the problem on unexpected driver absences, but the union on Monday accused the school system and Transdev of failing to assign drivers to all the routes. The bus problems present Perille with her first big challenges just two months into leading Boston Public Schools. She declined to say Wednesday whether she would seek the post permanently. The contract dispute adds another dimension to transportation problems that tend to mar the start of school. For years in Boston, buses have run notoriously late on the first day. Last year, more than half of the system’s buses were tardy, even after school officials tapped a team of MIT researchers to develop a new routing system that was supposed to improve on-time performance. Many students and families will be sweating it out at bus stops throughout the city as temperatures climb above 90 degrees Thursday. Thousands of those students will then board buses that have no air conditioning and will be whisked away to schools more than a half-century old that also lack central air. School officials plan to equip schools with extra fans and, for those where the bubblers have been shut off because of lead pipe contamination, extra bottles of water. Michael Maguire, a Latin teacher at Boston Latin Academy, is challenging Mayor Martin J. Walsh and the superintendent, who works in a three-year-old renovated building in Dudley Square, to shut off all central air in administrative buildings until all schools are equipped with it. As part of the push, which he began on social media earlier this year, Maguire posted a picture that showed a portable digital thermometer in his classroom registering 88.9 degrees during Tuesday afternoon’s scorching heat. The challenge comes as Walsh and the school system have been moving slowly over the last few years to develop a comprehensive plan to modernize the city’s aging school buildings, most of which were built prior to World War II. Perille said Wednesday that the effort should swing into high gear this fall when she plans to recommend certain schools for closure, renovation, or replacement, as well as another round of community engagement. She said the school system will have to make some hard choices and it will be a multi-year decision.